Fancy, aka White Oak, is a two-year-old small female, born August 22, 2000. She wasn't fast enough to qualify for racing, which makes her perfect for a couch potato! Fancy is getting adjusted to her new environment day by day, and with her sweet, loving personality will be a greyt companion pet! Fancy has adapted quite quickly to her foster home. She is very curious with a cute little hesitation at new noises; like the sizzle from the frying pan; garage door opening; telephone ringing. Fancy's ears go up and she peeps her cute little head around the corner to see what is happening. 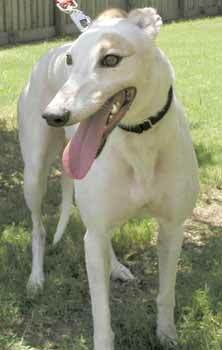 She loves to follow her 5½-year-old foster greyhound brother and gets along really well with her foster Westie sister who is 14 years old. They have now actually shared the same bed. Every morning Fancy runs over to the toy box and empties out all the stuffed toys, about 30 of them, and collects them on her bed so later she can sleep with them. If you pick them up before she is ready she will run over and get them again. 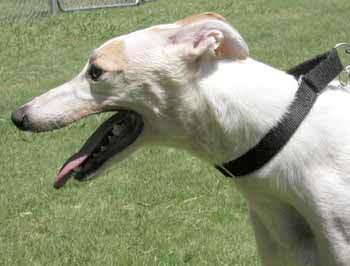 Fancy is a very sweet little girl and will make a 'greyt' addition to a family.